It freaks me out every time. 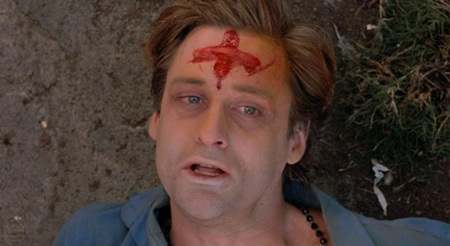 This is the image that flashes through my mind whenever Ash Wednesday rolls around. Go ahead. Laugh. It’s kind of funny but also kind of not. Cinematic images have this kind of indelible impact over the way in which I view so many things. “The Serpent and The Rainbow” which was based on the book by We Craven, came out in the late eighties and successfully depicted a violent, racist and stereotyped idea about the nature of the Voodoo Religion in Haiti where is was shot. It made Black Haitians look like crazy, evil people who couldn’t wait to poison you, bury you alive, take your heart out, and drink your blood. This is essentially what they attempt to do the White Doctor played by Bill Pullman when he goes on a mission into the heart of darkness as White men do to look into a special medicine used in Voodoo rituals on behalf of a Western pharmaceutical company. Blah Blah Blah. He gets in over his head and ends up buried alive with a Bloody cross on his head. Look, all I know is that despite the idea that the Holy Cross is perhaps meant to ward off demons and sinners or ghosts and spirits, seeing a cross on peoples heads every Ash Wednesday has the opposite effect of making me want to turn and run away from them as if they were possessed by whatever evil they’re supposed to be now free of. And it’s because of that image up there, because of the strange and falsely interpreted depiction of the Voodoo religion in a film that gets so much wrong with regard to Catholicism’s relationship to Voodoo, two Religions that are so much more closely linked than separate. Anyway, I begrudge no one their freedom to worship freely. It just weirds me out that’s all.